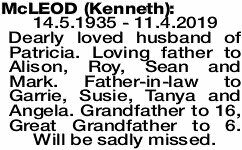 14.5.1935 - 11.4.2019 Dearly loved husband of Patricia. Loving father to Alison, Roy, Sean and Mark. Father-in-law to Garrie, Susie, Tanya and Angela. Grandfather to 16, Great Grandfather to 6. Will be sadly missed. In Lieu of flowers, donations to The Heart Foundation and Lions International. 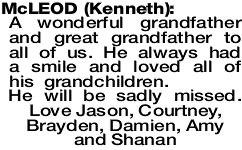 A wonderful grandfather and great grandfather to all of us. 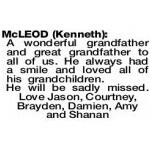 He always had a smile and loved all of his grandchildren. 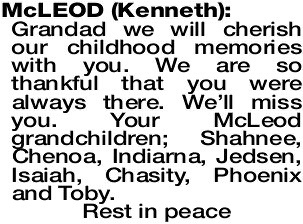 MCLEOD KENNETH Grandad we will cherish our childhood memories with you. We are so thankful that you were always there. We'll miss you. 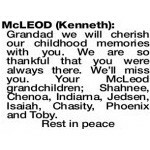 Your McLeod grandchildren; Shahnee, Chenoa, Indiarna, Jedsen, Isaiah, Chasity, Phoenix and Toby.